SnapCacklePop: Kelly Clarkson delivers special message for new video..! 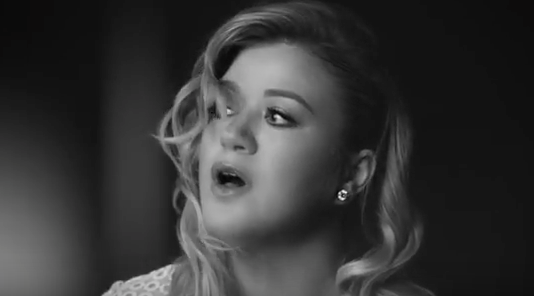 Kelly Clarkson delivers special message for new video..! "This song is basically my past, present, and future. It's my love letter celebrating and thanking my husband for being a man that knows how to love me and our children without expecting anything in return. 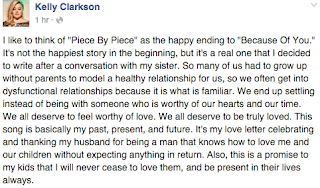 Also, this is a promise to my kids that I will never cease to love them, and be present in their lives always"
Calling out the track is the happy ending to Because Of You, Clarkson is obviously is a better place now she has found her happiness. 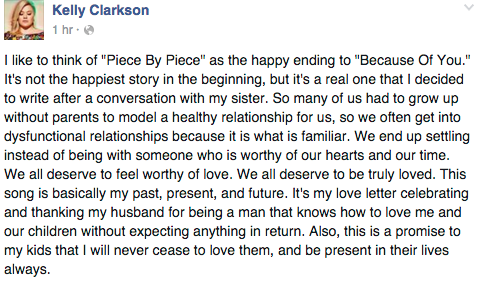 Check out the video below for the very personal song from Clarkson and get your copy of the album Piece By Piece on iTunes now..!